A motorcyclist in Lakeland was killed Friday when a truck hit him after he turned out of a Harvey Davidson parking lot, police say. 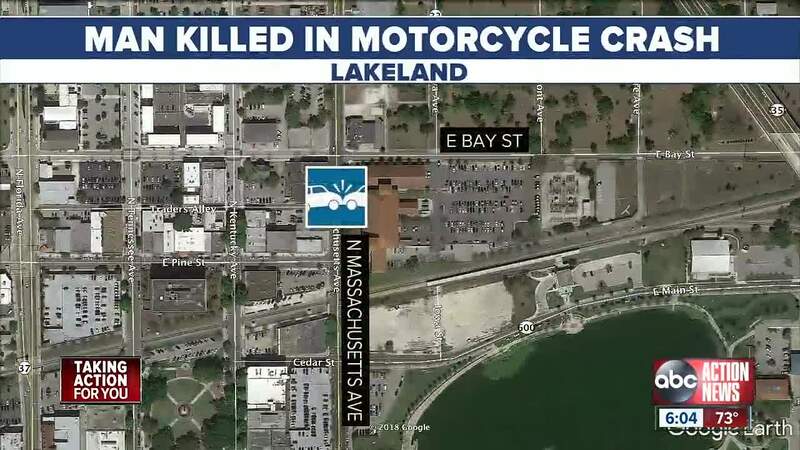 LAKELAND, Fla. — A motorcyclist in Lakeland was killed Friday when a truck hit him after he turned out of a Harvey Davidson parking lot, police say. Alejandro Perez, 31, was driving an F-150 southbound on SR 33 when he switched lanes and hit 53-year-old Jimmie Purcell, according to police. Purcell turned into the outside lane from the parking lot while Perez was in the inside lane. Purcell was thrown from the motorcycle. First responders provided life saving measures, but he was pronounced dead at the hospital around 7:15 p.m.
After hitting Purcell, the truck struck a sign and then slid down an embankment into a drainage ditch. Perez's passenger ran away from the scene on foot, but was caught quickly by officers. Authorities say the road was closed for five hours while the Traffic Homicide Unit investigated. No charges have been filed at this time and the investigation is on-going.